Greenhouse gas emissions (GHG) in North America have already been reduced by displacing coal with natural gas, the cleanest burning hydrocarbon, to generate electricity. The use of hydraulic fracturing, or fracking, has reversed declines in natural gas production. Canada has an opportunity to make a significant, positive impact on the global environment by exporting natural gas to developing countries like China and India. While the overall outcome of using more natural gas can improve global air quality, the industry acknowledges that each phase of oil and gas development has some level of air emissions that can impact local air quality. Reduction of emissions is a priority for continued responsible development of resources. Regulators, government agencies and the industry are working hard to identify and reduce emission sources. Recycling water onsite and/or transporting water by pipeline to reduce the need to transport water by truck. These are examples of clean technologies that reduce emissions of oxides of nitrogen (NOx), sulphur dioxide (SO2), volatile organic compounds (VOC) and particulate matter (PM). Silica dust is another air quality concern that is addressed by fracking equipment that filters silica dust. 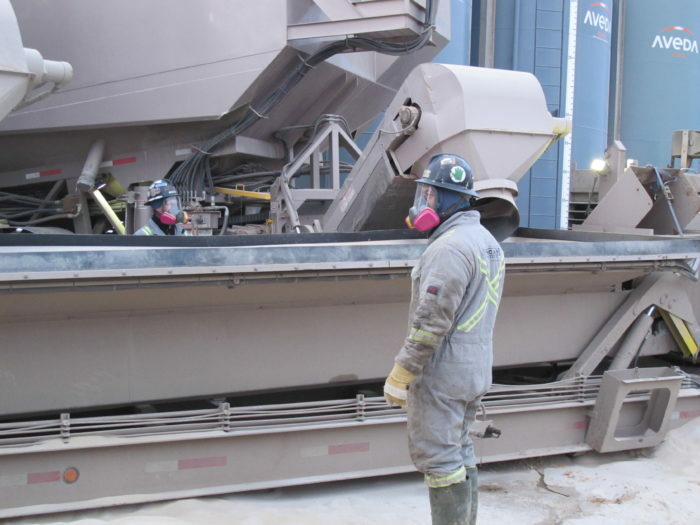 Operators are required to wear a full-face respirator when they are within 10 metres of the source of silica dust. Green completions essentially eliminate air emissions associated with flowback fluids. The process involves using equipment to separate the natural gas and liquid hydrocarbons that come to the surface with the flowback fluid as the well is being prepared for production. Rather than releasing the natural gas into the air or burning it off, known as “venting” or “flaring” respectively, it is directed to either storage tanks, the pipeline gathering system and transported to processing plants, or portable equipment that treats the natural gas and hydrocarbons onsite. The natural gas and hydrocarbons can then be used during production or sold. Green completions make both environmental and business sense. Using this process the emissions associated with venting and flaring are eliminated and the operating company has gained a product that is useable and sellable. The use of green completions will become more widespread as provincial regulators prioritize air management and further develop regulations and guidelines to reduce flaring and venting. Between 1996 and 2010, environmental regulations in Alberta resulted in an 80% decrease in natural gas flaring from 1996 to 2010, reducing GHG emissions by more than eight million tonnes of carbon dioxide equivalent (CO2e). In British Columbia, regulations are on track to eliminate routine flaring. The companies that own oil and gas wells and production facilities are working just as hard as fracking companies to reduce the impact of oil and gas activity on air quality. At the federal level, the Canadian Council of Ministers of the Environment (except Québec) agreed to implement a Canada-wide Air Quality Management System (AQMS) as a comprehensive approach for reducing air pollution in Canada. The British Columbia Oil and Gas Commission monitors air quality from oil and gas activities in the province in order to protect public safety and conserve the environment. The province has also set out guidelines to reduce flaring and venting. Increasing global use of natural gas is an opportunity to reduce greenhouse emissions. For every 1,000 MW of coal-fired power generation converted to natural gas powered electricity, annual CO2 equivalent emissions are reduced by 4.4 million tonnes. According to yousustain.com, that is equivalent to taking 862,745 cars off the road for a year.